Happy Veteran's Day. Happy Remembrance Day! Thank you to all who serve our nations at the risk of their own lives. Time to take a sunshine break! After a week of rain and the threat of Tropical Storm Sandy it was nice to have to squint again. I love the desert. Well at least one particular desert. Recently I had the chance to visit one of my favorite places, Tucson Arizona, a homey little city of one million people in a green desert valley surrounded by mountains. And, much as the desert revives with a rainstorm, a trip to this lovely part of the country was just what I needed. Thanks to my dear friend Mari for dragging me out of my cave! I don't know what your idea of desert is, but few are as green and plant-rich as the Sonoran Desert. It's amazing to me that the area was even settled. Would you want to clear this land? Upon seeing the natural landscape--there's very little you could touch in this setting that isn't scratchy or prickly--I wonder how anyone could travel through it by foot or on horseback. Love the color and texture of multiple species of cactus, shrubs, and grasses! 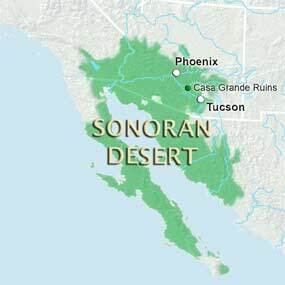 The Sonoran desert stretches from southern Arizona and California into Mexico. In just a limited area stand the amazing Saguaro Cactus. Saguaro! This one is probably about 12-15' tall. Day trip south toward Mexico. Arizona is much more than desert. Flagstaff, in the north, averages 100 inches of snow each year. The northern plateaus and mountains are covered with evergreens. Of course, many forget that the Grand Canyon is in Arizona. There's the red rocks of Sedona, the mesas of the Four Corners area, and barren stretches of land bearing ghost towns. Far south is the old mining town of Bisbee. Copper mining made the city of Bisbee. In 1910 it had a larger population than Phoenix or Tucson, The famous Copper Queen Hotel still stands in the middle of town. I don't think there is a part of town that is not on an incline or hillside. One of my travel companions poses in front of Wyatt Earp's home in Tombstone, Arizona. Now that we are heading into winter in the Northern Hemisphere, let's talk about sunny getaways. What are your favorite destinations? Have you been to the desert southwest? Where would you love to travel to in 2013? I wish you all pleasant trails and beautiful sunsets! our youngest, and last contiguous US State. Debra E. Marvin tries not to run too far from real life but the imagination born out of being an only child has a powerful draw. Besides, the voices in her head tend to agree with all the sensible things she says. Debra likes to write, weed and wander and is blessed to have the best family and friends in the world. She has decided she needs to live closer to her grandchildren. She’s thankful each day that God is in control, that He chooses to bless us despite ourselves and that He has a sense of humor. Her work has finaled in the TARA, Great Expectations, Heart of the Rockies, Maggie, Rattler and most recently, the Daphne DuMaurier for the second time. Not too bad considering she’s trying a mashup of gospel and . . . gothic. The shift back to 30 degree temps was difficult but I am so glad I took a mini break to Arizona! I love the colors, the landscape, the architecture, the mountains and the sky. The Desert even has a wonderful fragrance..
Lovely pictures, Deb. I'm glad you had a wonderful time. I've never been to Arizona, but not that my sister lives there, I hope to get there one of these days. It has so much to offer, even for a water girl like me. and you! I have never been to the desert and would love to visit the Four Corners some day as I've only done so virtually. We do have a desert in Maine, believe it or not, but I haven't been there yet. Though my children loved it when they were young. Thanks Carla. I appreciate the heads up on Susan's book. I have had the pleasure of touring that part of the state as well and into northern New Mexico. The mesas are hauntingly beautiful. I really need to read The ShadowCatcher's Daughter, don't I? Your pics are so cool! I want to know how you got in amongst the cacti without ripping yourself up. Looks like a wonderfully fun trip. So glad you had the opportunity to get away for a few days. I too enjoyed Arizona, though I never made it much further south than Phoenix. One of the churches we visited had a whole wall of picture windows out one side that looked out over some mountain range. Watched the sunset and worshipped, even if I was distracted and missed some of the sermon. I've only been to Arizona once, but I was amazed by how different the colors are. Oooh, lovely pictures. I'd love to visit those museums, too! Sorry to be such a slacker today. Jen there was one little area I could sneak into and stand in the center. Pretty impressive cactus, huh? This was in my friend's neighborhood. I'm amazed at the size of the trunks on some of them. You definitely don't want to trip. Lisa, Phoenix is such a huge city and actually hotter than Tucson. I find they aren't very similar. I went to a writer's conference once in Mesa, and did the obligatory shopping in Scottsdale. Went horseback riding in Apache Junction. Come to think of it, I've been all over that state. I can't get enough of the mountains! Dina, I fell in love with the desert and the mountains the first time I visited. I agree, the colors are lovely. Grass is a luxury - I'm okay with that... but it seems odd to me to not be able to send the kids out to go play on the lawn! DeAnna, the museum in Bisbee was very very nice. I was quite impressed given the size of the city. I scribbled down the name of two or three books the gift shop clerk suggested. The museum really inspired me with ideas for a book. Great photos! What a gorgeous desert. I cannot imagine settling that land, though. I'm a huge wimp and there are too many sticky things to clear. Our local Veteran's Day Parade was wonderful. Once the sun warmed us up, it was much more fun. :) I'm definitely a warm weather person. Thanks for reporting on your trip. I'm so glad you had a chance to go, and I'm equally glad you arrived safely back home. Thank you ladies! I enjoyed taking the photos but sure miss my old 35mm camera - except for the cost of film and developing! I hope to get a good camera again someday.